Herbert James Mockford Payne was born at Hobart on 17 August 1866, son of Henry Payne, a gardener, and his wife Hannah, née Reed. Educated at the Central State School in Hobart, he married Margaret Annie Stones, at Ulverstone, on 18 January 1888 under Congregational forms, and by the end of that year was a draper’s assistant in Burnie. Soon he established his own ‘emporium’ in that town, self-proclaimed as ‘The People’s Draper’. Freemasonry and the Manchester Unity International Order of Oddfellows were among his interests, but politics came to dominate. Payne was to the fore in the establishment, in 1902, of the Reform League, Tasmania’s counterpart to Victoria’s Kyabram movement. Under that aegis he won the Burnie seat in the House of Assembly at the general elections on 2 April 1903. The North-West Advocate saw the poll, state-wide, as ‘an election of elections’, not only the Burnie result flowing from Payne’s ‘energy and initiative’. The Reform League’s victory secured the accession of a government, led by W. B. Propsting, which Payne supported throughout its term (to July 1904). While sympathising with the Premier’s efforts at quickening development and diminishing the power of old-time elites, Payne’s greater enthusiasm was for cutting government costs (even to the extent of extinguishing the tiny University of Tasmania) and reducing direct taxation. These remained the elements of Payne’s career in state politics. He was active in the further, highly convoluted organisation of non-Labor political forces in Tasmania, playing a prominent role in the formation of the Liberal League in 1909. He was re-elected for Burnie in 1906, and after the introduction of multi-member electorates in 1909 he represented Darwin (subsequently Braddon). Payne’s assiduity in Parliament saw him elected to parliamentary posts of some dignity. He was Chairman of Committees (1909–12) and Deputy Speaker (July–September 1910). He was also a member of the Public Accounts Committee (1914–19). Payne upheld the interests of his region and was always strong for temperance and other moralistic causes. Payne sat on the three-member Royal Commission into Wages and Wage Earners (1906–07), an episode of path-breaking importance in Tasmanian social history. His minority report dissented from his colleagues’ readiness to pass judgment on the data gathered. In September and October 1907 Payne attacked the findings of his fellow commissioners, disparaging their report as a misrepresentation of the evidence. While sympathetic on some welfare issues, such as proposals for free state education and a compulsory half-holiday for shopkeepers and their employees, Payne was forthright in criticising Labor radicalism and trade union assertion. His vigour in opposing the federal Labor Government’s attempt in 1911 to secure further powers by referendum resulted in a particularly lively meeting in Queenstown in late April. Meanwhile Payne had become involved in matters relating to closer settlement of the land. As a critic of the old order, he lambasted ‘the rapacity of large landholders’, and of ‘dummying’, the practice by which speculators frustrated the spread of yeoman farmers. Yet in 1908 two bureaucrats from the Lands Department charged that Payne had himself colluded in such ‘dummying’. A detailed inquiry duly exonerated all parties of malice and misrepresentation, but feeling had run high and Payne appeared in a dubious light. Since 1906 he had forsaken his drapery business and thereafter was more a speculator and investor, land inexorably to the fore. The inquiry bore incidental witness to his care in attending to his constituents’ problems. 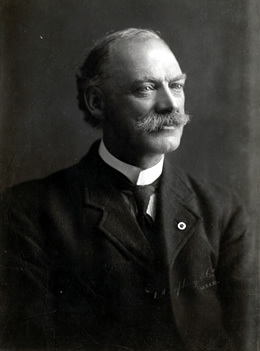 In 1912 Payne became Treasurer, Minister for Agriculture, and Minister for Railways in a government led by A. E. Solomon. This was a tincture more liberal than the several non-Labor ministries of the previous eight years. Payne continued his efforts to shift tax onto ‘unearned’ wealth and was happy to increase expenditure on education, railways, agricultural improvement and assistance to immigrants. He retained office until the Government’s defeat by Labor in April 1914. Payne became passionate in support of the Allied cause in World War I, and of the local ‘loyalty’ movement. In July 1915 he introduced a motion condemning the federal Government’s new proposals for a powers referendum, insisting that Australia’s total energies must be directed towards upholding the empire. In September he showed hostility to a university academic, Herbert Heaton, when the latter suggested that it was not only the ‘Huns’ who were likely to commit war atrocities. In August 1916 he spoke out strongly in favour of conscription. When, in June 1918, at an Ulverstone welcome for returned servicemen, a Catholic priest declared that the Irish ‘would not spill one drop of blood for [England]’, Payne responded with fury and a call for three cheers of loyalty. On 20 November Payne’s loyalist passions led to a grotesque clash with Labor’s G. G. Becker: ‘I will not be insulted by Herr Becker’, he proclaimed, challenging for fisticuffs. The pair went into the lobby and ‘through the open door from the House . . . could be seen exchanging blows amidst great commotion’. Reluctant apologies went around. Prior to the 1919 Tasmanian election, Payne sat on a select committee on the Electoral Act, which considered how overseas servicemen could vote in the forthcoming polls. Its suggestions included the citation on the ballot paper of each candidate’s party attachment. In fact that change awaited many years, and events at the end of the war otherwise overtook the committee’s proposals, but they acquire interest in light of Payne’s future role as an electoral reformer. Payne had topped the first Darwin poll and, while not doing so well again, never faced loss through five elections from 1909 to 1919. Venturing further, he determined in late 1919 to contest the Senate. His last noteworthy contribution to the Assembly on 16 October was to denounce business interests for combining to force from the market tyres made by the Australian firm, Barnet Glass Rubber Company. Labor leader, Joseph Lyons, congratulated Payne on the speech—a rare harmony. Payne’s Senate candidacy, under Nationalist auspices, succeeded. He was to be returned in 1925 and, for the United Australia Party, in 1931. Immediately, Edward Mulcahy protested against Payne being granted the third periodical place, leaving only a short-term casual vacancy for himself. Some of the issue’s complexity derived from vagueness as to the relation between the Senate Elections Act 1903 and the Commonwealth Electoral Act 1919. Beyond that, the argument went that while Payne came third in primary voting, further distribution of preferences lifted Mulcahy’s final vote above Payne’s tally. Mulcahy also suggested that preferences of the final failed candidate should have been distributed to ascertain the other candidates’ relative standing. The High Court found in Payne’s favour. Payne is most famous for his introduction in the Senate in July 1924 of a measure for compulsory voting in Commonwealth elections, the proposal meeting little opposition and becoming only the second private senator’s bill since 1901 to carry Parliament. This was the Commonwealth Electoral Act 1924. Both at the time and since, the move has been seen as a victory for machine-managers across the party system, happy to avoid any possible odium in the matter, especially as the initiative was taken by relatively independent people like Payne and E. A. Mann, the latter having guided the bill through the House of Representatives. Yet Payne acted not as a ‘front’ man, but from conviction; compulsory voting, he proclaimed, was a necessary complement to democracy in order to counteract popular ‘apathy and indolence’. Both before and after 1924 he attended to other electoral issues. One was his opposition to the Commonwealth Electoral Act of 1921, which was designed to prevent the states circumventing Commonwealth electoral law that required state members to resign their seats before contesting federal elections. In 1922 he argued for proportional representation for the Senate and, in 1934, suggested that circular ballot papers would serve to reduce donkey voting. With regard to the House of Representatives, Payne insisted that ‘community of interest’ rather than geography should determine electorates. As a member of the Joint Select Committee on Commonwealth Electoral Law and Procedure in 1926, he may have endorsed further moves towards efficient and comprehensive polling, although he was not a member of the committee when it reported. Perhaps second in Payne’s contribution to Senate debates was his critique of tariff protection. His scepticism derived from belief in competition and abhorrence of feather-bedding. As he said, ‘honorable senators’ could well have wondered whether he was a protectionist or a free trader. In many respects Payne upheld nineteenth-century ideas as to world-ranging free trade being the best guarantor of peace and prosperity. Opposing the high tariff wall of the Scullin Labor Government he said: ‘It was never intended by the Creator that our country should be self-contained . . . we are part of the human family spread over the face of the earth’. Yet he also described himself as being in favour of a ‘sane protective policy’. Occasionally he invoked his experience as a retailer to show how tariffs short-changed consumers, such views being sharpened by his provincial-town, small-state background. The League of Nations always attracted Payne’s interest, and a trip to Britain, Europe and North America in 1928 heightened this interest. He attended the 25th conference of the Inter-Parliamentary Union at Berlin and duly endeavoured to form an Australian branch of the association. In 1935 he called for strong action against Italy in the Abyssinia crisis, and for the exercise of sanctions against offenders of the league. Two years later he upheld the policies of Stanley Baldwin and Neville Chamberlain. Visiting Japan in the 1930s Payne found much to admire there, pointing out that it was ‘the white peoples of the world’ who had brought about Japan’s rapid industrialisation. Apropos Australia’s international position, Payne upheld sizeable defence spending and population increase. The latter issue coalesced with his long-standing interest in immigration, child migration in particular becoming a matter of frequent remark. He saw reafforestation as a useful outlet for child migrants. Immigration (though more importantly trade) was also part of the work of the 1928 Australian Scottish delegation, which Payne joined. (No, he was not a Scot himself, Payne told the Senate, but his wife’s grandparents were—as a boy he had read Sir Walter Scott’s Fair Maid of Perth, and his own father’s birthplace was Perth, Tasmania.) Again continuing long-established interests, he upheld efforts to encourage births and diminish natal troubles. Late in 1936 he welcomed modification of ‘the extraordinary idea . . . prevalent among the young girls of Australia . . . that the most desirable figure to cultivate was one that resembled a paling’. Other social welfare issues to attract Payne concerned benefits for ex-servicemen, the blind and the aged. He spoke with an authority that derived especially from his involvement with masonic and friendly societies. While at times echoing conservative shibboleths as to Australia striving for impossibly high living standards, Payne kept alert to everyday aspirations. Recent massive imports of rayon, opined the ex-draper in 1936, allowed ‘for the first time . . . an opportunity to the poorer classes to clothe themselves decently and attractively’. Of a different order was his concern for Papua and New Guinea. This interest developed especially through service on the Royal Commission on the Navigation Act. The commission’s second report (relating to New Guinea and Papua) urged suspension of the Act in those domains. Payne came to be an enthusiast both for the region’s potential as an economic boon to Australia, and for its general welfare. While paternalist, his nostrums included native representative councils in New Guinea. Payne also occasionally spoke for Aboriginal welfare, the Northern Territory falling within his interests, as did Antarctica. While renouncing his opposition to some Labor policies, Payne remained vehemently against the left. He abhorred various restrictive policies of the trade unions, above all the use of legislation and awards to restrict the number of apprentices in relation to adult workers. Communists became his frequent target: they, not the New Guard, were ‘endeavouring to destroy our social fabric’, he said in 1932. Such feeling sharpened as he saw international communism working against world peace. Payne never forgot his electorate, surely telling no lie when averring that he worked harder outside parliamentary sessions than during them. He suffered jeers when modifying his usual critique of tariffs so as to argue for Tasmania’s carbide, timber, fruit and rabbit fur. The island’s disabilities under the Navigation Acts appeared in his, as in virtually all Tasmanian politicians’, repertoire. Likewise he made customary moves in support of extended postal and telephone services. In June 1935 Payne, who had been a temporary chairman of committees from 1929 to 1933, told the Clerk of the Senate that he would seek the position of President of the Senate in the forthcoming session. That move aborted, yet the septuagenarian contested the 1937 election. Now at last he suffered defeat. His final parliamentary speeches included a commitment to international goodwill, and repudiation of the disparagement of the Senate by the Treasurer, R. G. Casey. In earlier years, Payne listed his hobbies as gardening, stock-raising, and bowls. Later, motoring joined the list: he ever saw the internal combustion engine as vital in aiding Australia’s development, and recognised Berlin’s airport of 1928 as auguring well for the future of the civil aviation industry. By his first marriage, Payne had two sons, Leslie Herbert and Gordon Charles, and two daughters, Coralie and Rita Annie; the elder son, Leslie Herbert, echoed his father’s interests, as he served in World War I, was MHA for Denison (1924–25), and directed Tasmania’s Institution for the Blind, Deaf and Dumb. Margaret Payne died in 1936, and on 30 March 1938 Payne married Constance Evelyn Rogers at Wesley Church, Melbourne. Predeceased by Leslie Herbert, Payne passed his remaining years in Melbourne’s northern suburbs. He died at Sacred Heart Private Hospital, Coburg, on 26 February 1944. Both houses noticed the event, R. G. Menzies invoking Payne’s role in that ‘splendid tradition’ whereby erstwhile members of the Tasmanian Parliament proceeded to grace the federal sphere. Payne merited praise: he incarnated the bourgeois spirit, yet transcended it. Scott Bennett, ‘Payne, Herbert James Mockford’, ADB, vol. 11; Payne file, ADB, ANU; Mercury (Hob. ), 28 Feb. 1944, p. 4; Argus (Melb. ), 28 Feb. 1944, p. 5; Examiner (Launc. ), 3 Apr. 1903, pp. 4, 6; P. Loveday, A. W. Martin and R. S. Parker (eds), The Emergence of the Australian Party System, Hale & Iremonger, Sydney, 1977, pp. 360–3; Examiner (Launc. ), 13 Jan. 1903, p. 5, 14 Feb. 1903, p. 5. Mercury (Hob. ), 22 May 1903, p. 2, 25 May 1904, p. 4, 19 Aug. 1903, p. 6, 27 Aug. 1903, p. 3, 10 Oct. 1903, pp. 6–7, 3 Oct. 1903, p. 6, 24 Mar. 1904, p. 6, 12 Nov. 1907, p. 6. Mercury (Hob. ), 5 Aug. 1909, p. 2, 17 Sept. 1903, p. 3, 15 Apr. 1904, p. 6, 11 July 1907, p. 6, 23 July 1908, p. 6, 15 Aug. 1906, p. 5, 16 Aug. 1906, p. 6, 30 Oct. 1908, p. 6, 20 Nov. 1908, p. 7, 31 Oct. 1907, p. 6, 25 Nov. 1911, p. 7, 21 Nov. 1908, p. 6, 29 Aug. 1906, p. 6, 14 Nov. 1908, p. 6. TPP, Royal Commission on Wages and Wage Earners in Tasmania, report, 1907; Mercury (Hob. ), 28 Sept. 1907, pp. 6–7, 12 Oct. 1907, p. 6, 12 Nov. 1908, p. 7, 14 Oct. 1911, p. 7; Examiner (Launc. ), 7 Mar. 1911, p. 6, 3 Apr. 1911, p. 6; Mercury (Hob. ), 22 Apr. 1911, p. 10. Mercury (Hob. ), 9 Aug. 1906, p. 6, 30 Aug. 1907, p. 6, 2 Nov. 1907, p. 6, 2 Oct. 1908, p. 6, 29 Sept. 1911, p. 7, 3 Oct. 1908, p. 6, 14 Oct. 1908, p. 6, 5 Nov. 1908, p. 6; TPP, Select Committee on Charges of Land-dummying against Mr Payne, report, 1909. TPP, Financial Statements, 1912, 1913. Mercury (Hob. ), 23 July 1915, p. 8; Marilyn Lake, A Divided Society: Tasmania During World War I, MUP, Carlton, Vic., 1975, p. 39; Mercury (Hob. ), 16 Sept. 1915, p. 6, 4 Aug. 1916, p. 7, 7 June 1918, p. 5; Lloyd Robson, A History of Tasmania, vol. 2, OUP, Melbourne, 1991, p. 358. Mercury (Hob. ), 21 Nov. 1918, p. 4; TPP, Select Committee on the Electoral Act (Votes for Soldiers on Active Service), report, 1918. Mercury (Hob. ), 17 Oct. 1919, p. 7; Mulcahy v. Payne (1920) 27 CLR 470. Age (Melb. ), 25 July 1924, pp. 8–9; Bulletin (Syd. ), 31 July 1924, p. 13; G. S. Reid and Martyn Forrest, Australia’s Commonwealth Parliament 1901–1988, MUP, Carlton, Vic., 1989, pp. 113–14; CPD, 17 July 1924, pp. 2179–82, 14 Mar. 1923, p. 341, 8 Dec. 1921, pp. 14080–2, 9 Aug. 1922, pp. 1215–16, 25 July 1934, p. 667, 2 Aug. 1922, pp. 971–2. CPD, 25 June 1931, pp. 3012–13, 13 July 1921, pp. 9973–7, 8 Aug. 1923, p. 2299, 23 Nov. 1932, p. 2641, 31 May 1938, p. 1535. CPD, 5 July 1923, p. 703, 14 Feb. 1929, pp. 231–2; SMH, 13 Aug. 1928, p. 12, 14 Sept. 1928, p. 13; CPD, 13 Nov. 1935, pp. 1520–1, 26 Aug. 1937, pp. 170–1, 24 Apr. 1936, p. 899. CPD, 9 Sept. 1925, p. 2312, 1 Aug. 1934, p. 997, 24 Nov. 1927, pp. 1825–6, 20 Nov. 1936, p. 2161, 26 June 1924, p. 1605, 25 Sept. 1935, p. 157, 14 Feb. 1929, pp. 232–3, 12 Dec. 1934, p. 1070, 3 Dec. 1935, p. 2352, 26 Aug. 1937, p. 173, 20 Nov. 1936, p. 2159. CPD, 2 Dec. 1936, p. 2583, 24 Nov. 1920, pp. 6894–5, 29 June 1921, pp. 9455–6, 27 Oct. 1931, pp. 1213–14, 24 Feb. 1932, pp. 173–4, 25 June 1931, p. 3012, 2 Dec. 1936, p. 2641. CPD, 22 Aug. 1923, pp. 3300–1, 16 Nov. 1932, pp. 2363–8; CPP, Royal Commission on the Navigation Act (New Guinea and Papua), second report, 1925; CPD, 30 Nov. 1927, pp. 2245–50, 30 June 1937, pp. 717–19, 8 July 1925, pp. 752–3, 1 June 1933, p. 2021; SMH, 23 Sept. 1924, p. 8. CPD, 26 June 1924, p. 1606, 5 Aug. 1931, pp. 4933–4, 1 Aug. 1934, p. 997, 24 Feb. 1932, p. 175, 8 Sept. 1937, p. 692. CPD, 9 Oct. 1935, p. 528, 17 Aug. 1922, p. 1415, 6 Dec. 1933, p. 5563, 21 Mar. 1928, p. 3961, 19 Mar. 1929, p. 1411, 17 Aug. 1923, pp. 2957–8. Letter, Payne to Clerk of the Senate, 5 June 1935, A8161, S212, NAA; Mercury (Hob. ), 12 Oct. 1937, p. 10; CPD, 31 May 1938, pp. 1534–5, 1 June 1938, pp. 1594–6; SMH, 1 June 1938, p. 15. CPD, 14 Feb. 1929, p. 234; Examiner (Launc.) 30 Mar. 1936, p. 6, CPD, 1 Mar. 1944, pp. 712–13. This biography was first published in The Biographical Dictionary of the Australian Senate, vol. 2, 1929-1962, Melbourne University Press, Carlton, Vic., 2004, pp. 181-186.